A couple Decembers ago, I noticed something fairly alarming while looking through my Goodreads: I’d read exactly one book by an author of color that year. One. Out of 50. I really shouldn’t have been quite so shocked. I wasn’t making intentional reading choices, after all. But to be frank, I still believed at the time that a) I chose books based on nothing more than what I felt like reading, and that b) that was a good way to make decisions. In reality, of course, our reading choices are never only a matter of personal preference. We pick books based on recommendations, bookstore presence, marketing, cover copy, cover image, author recognition, buzz, reviews, and more. And every one of these factors are in turn affected by systemic racism, sexism, ableism, transphobia, homophobia, etc. It’s no secret that books written by and featuring white, straight, abled, cis men get the majority of publisher backing, bookstore exposure, critical acclaim, and reader attention. It’s also no secret that that’s because we as a society place a higher value on those stories and those authors—on those lives. We do it instinctively, but it’s a learned instinct, and what is learned can be unlearned—to a certain extent, anyway—with conscious, continuous effort. Since then, I’ve tried to make more intentional and more diverse reading choices, but I’ve still got a long way to go (not that there’s any end destination—you don’t read a certain number of diverse books and pack up shop). So in the interest of keeping myself accountable, here’s an overview of what and who I read this year, broken down into three categories: authors, main characters, and ownvoices. 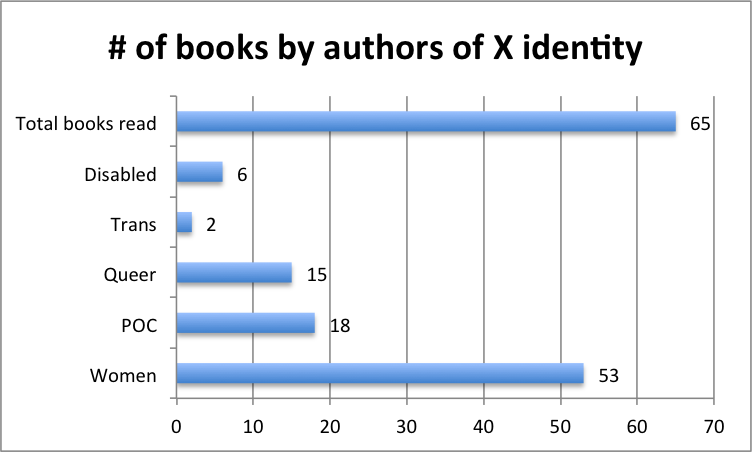 With this section, I’m looking at the number of books written by authors with marginalized identities rather than the number of authors with marginalized identities. Yes, this means some people were counted twice if I read more than one of their books (Seanan McGuire and Hannah Moskowitz, for example), thus increasing some category counts a bit. But I decided it was worth it, because a) with the exception of McGuire, all authors counted more than once were writing in multiple series/worlds, and b) I’m interested in not just whose voices I’m reading, but also where my money’s going, so looking at number of books versus number of authors seemed like a decent approach. None of this is an exact science, of course, not least because people don’t always disclose every aspect of their identities (which is completely legitimate; readers have no right to any personal information except what the author chooses to share). And even when an aspect of their identity is public, I may still miss it. Having said that, it’s fairly easy to find most of this information for most authors. The numbers work out to 82% women, 28% POC, 23% queer authors, 3% trans authors, 9% disabled authors. I’m doing pretty okay with women (although I would’ve bet good money I’d be at 90% at least), but I could/should be doing better with pretty much every other category. Especially trans and disabled authors. Part of the reason those category counts are so awful is that there just aren’t as many trans and disabled authors being published as cis and abled authors (see: ableism and transphobia), but mostly I just wasn’t intentionally seeking those authors out. They exist, they’re writing, they’re being published, and I need to be better about supporting them. And even when I was making intentional choices—like with POC and queer people—I’m still only averaging 1 in 4. It’s tempting to say, well, that’s much better than 1 in 50, but that’s not how this works. I don’t get to pat myself on the back for doing better than Absolutely Abysmal. I’m mostly interested in the authors I’m reading and supporting, but I was also curious how those numbers lined up (or didn’t) with characters’ identities. Determining which categories each character belongs to tends to be pretty clear cut, but I did have to settle on a definition of “main character.” For my purposes, a main character is any perspective character, meaning we follow them specifically and get inside their heads (even in third person). Note that I excluded some books from the total count: essay collections, short story anthologies, basically any book without proper main characters. The percentages here work out to 73% women, 38% POC, 22% queer characters, 3% trans characters, 22% disabled characters. What I find interesting here is: a) quite a few white people writing characters of color and abled people writing disabled characters, and b) more women than I would’ve expected writing men. I don’t have anything conclusive to say about these observations. There are all sorts of nuanced discussions surrounding who is “allowed” to write whom, but it all boils down to complexities of power, ownership, marginalization, self-determination, etc., none of which I have room to tackle here. Still, I think it’s important to pay attention to not only which authors you’re supporting, but also whose stories they’re telling. 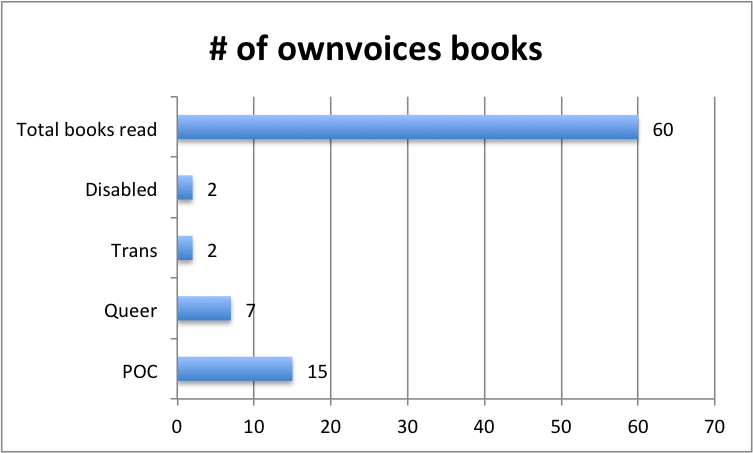 Speaking of which, Corinne Duyvis coined the super handy term “ownvoices” earlier this year. It refers to books where the author shares some marginalized identit(ies) with their character(s). For instance, Corinne is autistic and she wrote about an autistic girl in her upcoming ON THE EDGE OF GONE, making that an ownvoices book. These books are important for many reasons, but a big one is that people with marginalized identities telling their own stories will forever and always be more important than outsiders (usually privileged outsiders) telling those stories for and instead of them. Which doesn’t mean marginalized folks should only ever write about people just like them, because super nope. This is about what you as a reader should be seeking out, not about policing what authors should be writing. Percentages: 25% POC, 12% queer folks, 3% trans folks, 3% disabled folks. Once again, this shows some pretty big gaps. 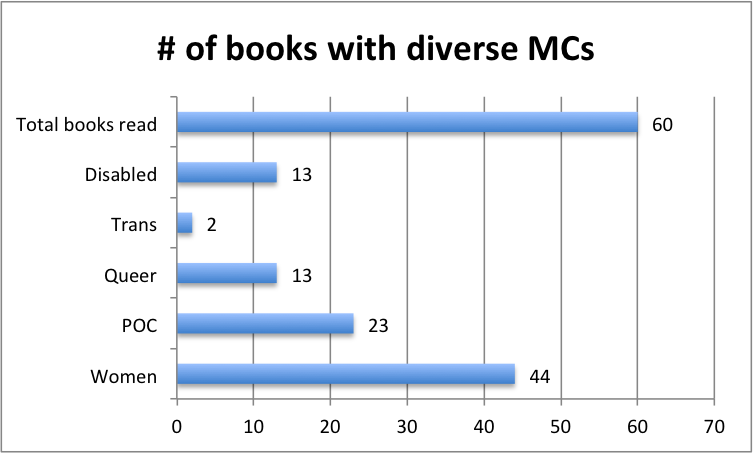 While I read a fair number of ownvoices characters of color (not that I shouldn’t be reading more, just that compared to the other categories and considering the total number of authors of color I read, this is the most “successful”), I’m super lacking in the other areas, especially trans and disabled ownvoices. But really, I need to do better across the board. Hopefully I’ll soar way past those figures, but I like to start with something that seems pretty easily attainable based on past performance. If I give myself a goal (any kind of goal, not just in terms of reading) that feels immediately daunting, it’s likely that I’ll go hide from it until it goes away and forgets about me. I considered giving myself an ownvoices goal as well—for instance: 50% of books I read should be ownvoices—but I figure if I’m already hitting all my other goals, I’ll probably be getting a lot of ownvoices books in the mix automatically. I’ll keep an eye on it, though, and if I notice my ownvoices numbers aren’t where I want them, I’ll reassess. Even if you can’t or don’t want to enter the giveaway portion, please still join the discussion on Twitter using #DiverseReadingGoals and/or in the comments. I can’t wait to see not only what everyone else is aiming for, but also how everyone’s fared come next December. How should that word be used, if at all? Who has the right to write which stories? What should criticism look like? Has criticism become so critical as to be unconstructive? Does it matter if it has? How can we support each other and also demand we all do better? What does “better” look like anyway? What is our responsibility as writers? What’s our responsibility as people in power, people who are marginalized, and (like most of us) people who are both? Are these conversations even useful? Again, who makes that call? There’s a lot in there to unpack and no concrete answers to find. Because these questions aren’t meant to be answered so much as meant to generate discussion, exploration, and intentional thought. I’m thrilled these conversations are happening so often and with such passion. I think they’re important even if their effectiveness is questionable. I don’t know how much these discussions are changing the industry, if at all. I don’t know if we’re all just shouting the same things over and over at one another in some inescapable Diversity Loop. I don’t know if we’re doing any good for this community, for readers, for writers, for the wider culture. I don’t know. But I do know what effects these conversations have had on me. I think about power a lot. In what ways do I hold power? In what ways (intentionally or otherwise) do I wield it? In what ways do I lack power? What effect does that lack have on me? Write responsibly, respectfully, and intentionally. Strive to do no harm, but accept that you will fail. When you fail, listen, apologize, and try to do better next time. Over the years, I’ve considered each of these points thoroughly and found them to be useful. I’ve even shared them and felt fairly confident that they would be helpful for others, too. But lately I’ve been thinking about the underlying premises of this seemingly straightforward philosophy. First, it assumes I’m writing from a position of power. That assumption is true—I’m always writing as a white, cisgender person—but it isn’t the whole truth. I’m also always writing as a disabled, queer woman—aka from a marginalized position. Second, it assumes all stories are available for me to tell. This philosophy says that as long as I write “responsibly, respectfully, and intentionally,” I’m doing my due diligence and can proceed. This ignores the possibility that due diligence may not be enough sometimes. It ignores that some stories, no matter how carefully I approach them, are not mine to tell. Third, it assumes my greatest responsibility as a writer is to minimize harm. If you try to do no harm but also accept occasional, inevitable failure, the best you can do is to minimize harm, right? Wrong. There’s another option. Some folks feel the tenor and/or content of critique in the community has become too unforgiving (for lack of a better word). There’s no room for that second step in my philosophy anymore: failure. And there’s even less room for the third: second chances. This, they say, will frighten off writers from trying, resulting in no representation at all. Typically, those in this camp feel bad representation done in good faith is better than no representation, and that we should be careful not to constrict voices. Others feel critique is both necessary and useful regardless of how it’s presented. They’re wary of tone-policing the marginalized who have been hurt time and time again. Typically, this camp feels no representation is better than bad representation, and that if writers can be so easily scared off from trying with just the possibility of critique, then they shouldn’t be trying to “write the other”. My philosophy as outlined above rests on one other crucial premise: that I’m writing, specifically with the goal of publication. The idea that the best I can hope for is to minimize harm is only true if you assume I’m writing at all. I could just not. I could abstain entirely. I could either never write another word, or else write just for me. If I’m not writing, my stories can’t do harm. If “do no harm” is the goal…well, that’s about the only way to do it. I seriously considered never writing again. I considered it for a long time. I don’t want to do harm, and I know that any story I write (even those within my own experience!) will hurt someone somewhere. I’m fallible. I can try, but no matter how much good faith I have, I will fail. On top of that, me being published at all could do harm. I hold power in certain specific ways, and I know that if I get published I’ll benefit from that. For instance, I’m white. I know that if I write characters of color, I’ll see more marketing, more praise, more support than a person of color writing those characters would. More than that, “diversity slots” are still limited and my voice (on the axis of race) is privileged over others. I could take one of those rare slots open for people of color. That’s harm. So, if I don’t want to do harm, and if my stories will inevitably do harm no matter my intentions, and if the very act of sharing those stories will harm the careers and opportunities of others… Should I write? I think it’s a useful question to ask ourselves, and one we’re not usually encouraged to explore. During these diversity conversations, I often see people responding defensively, as though they’re being told they shouldn’t write X topic. That’s almost never what anyone is saying, but I think it’s worthwhile to ask yourself if you should write at all. Interrogate yourself, your goals, the costs to you and others if you pursue them and if you succeed. Should you write? I decided yes. It took a long while and it was an agonizing journey to get to that answer, but I decided yes. Of course, like most marginalized folks, I don’t want to be limited to writing only about my marginalizations, and I don’t want to write any world that excludes people different from me. Which means I will sometimes be writing from a position of power. Which means I will inevitably do harm. Acknowledge your power and your marginalizations. If you choose to write, do so responsibly, respectfully, and intentionally. I choose to write. Maybe someday I’ll choose to stop, but not today. This post isn’t meant to be prescriptive. I’m not saying anyone can’t or shouldn’t write. I am saying it’s useful to consider why you write. I’m saying it’s important to consider the harm you could do and whether the reason you write is enough for you to risk that harm. I’m saying these conversations—these fraught, difficult, complicated, important conversations—led me to realize that just because I can and want to write isn’t a good enough reason for me to do it. I’m saying I’ve found a good enough reason. I don’t know what the reason is for you. I’m not here to tell you what is or isn’t enough. No one could ever tell you that but you. I’m just here to ask some questions.